Saif Ali Khan in a freewheeling conversation with Sonil Dedhia/Rediff.com, ahead of the release of his film Happy Ending. Saif Ali Khan arrives at Mumbai's Mehboob Studios in his Audi R-8, and dives into his vanity van. He does not like giving interviews, and as he fidgets with his new Harrods flat cap, he argues with his manager about the long line-up of interviews for his latest film Happy Ending. 'I am not giving so many interviews in a day. It’s maddening! I can’t sit here the whole day,' he tries to reason. But when he decides to talk, there’s no stopping him. Saif discusses movies, babies and Islam with Sonil Dedhia/Rediff.com. Your last two films, Bullett Raja and Humshakals, were experiments that did not work. Are you back in your comfort zone with Happy Ending? I don’t have a life where everything I do works. But I do have a career where a couple of things go really wrong after which some good work comes up. I signed four films (Bullett Raja, Humshakals, Happy Ending and Phantom) at the same time. So it was a bit like hedging my bets. I know it's not the best way to approach cinema but sometimes, the business side takes over. I was hopeful that all four films would work. Unfortunately, the first two (Bullett Raja and Humshakals) did not. Now, the pressure is on Happy Ending. I am excited as well as frightened. Did the failure of those two films affect you emotionally? More than being affected emotionally, it was a learning experience. I have had ups and downs throughout my career. It’s an instinctive thing. Your instinct always says don’t do things you don’t believe in but invariably, you make a mistake by following someone else’s conviction. I was listening to other people's convictions and I feel I lost touch with myself. Ultimately, you either stay home or you work and the worst thing that can happen is that the film won't work. But life goes on. Also, I knew there was Happy Ending, a film I was comfortable with. (Interrupts) I have stopped praying (laughs). ...And now, you are reading a book called Beyond Monotheism. Have you become spiritual? My library at home has a section on science and religion because I like reading about that. I am aware of different theological thoughts. I don’t mind praying but I don’t even know when I am praying. I don’t think I pray to God for materialistic things. I think I just try to commune with the universe and say thank you for all the things I have got. I like praying in Urdu and Arabic. I also pray in churches and temples. I don’t have an agenda for praying. I do feel better after praying but I don’t know why because I feel no one is listening. (Thinks) Because it is ridiculous to imagine God is listening to me. There is too much suffering in the world for there to be a personal God. I am so well off and have everything, so what should I be praying for? People on the streets should be praying for survival. There are many suffering, and terrible things are happening in the world. I think God should listen to them, not me. What made you voice your opinion on Love Jihad recently? I gave my opinion because someone asked me for it. Someone from the right wing criticised my article and told me not to express my opinion. I think he was right because it wasn’t well written since I had other commitments and deadlines to meet. The first version that I wrote was nice but I rewrote it to tone it down. The fact is there have been many conversions in my family. Quite a few men in my family have married Hindu women and they have converted. But at this moment, I feel differently and don’t think it’s required. Why is there a change in your opinion towards conversion? I haven’t changed my opinion. I was always against conversion. Why do we bring religion in between? Everyone should be allowed to keep their own religion. Kareena (Kapoor) has not converted. If Soha (Ali Khan, Saif’s sister) gets married to Kunal (Khemu), I don’t think either of them will convert. You faced a lot of death threats when you married Kareena. Were you worried? Yes. Some people were not happy with us getting married. My father-in-law (Randhir Kapoor) had received some letters from anonymous people, claiming they will harm our family and bomb the place. But these things did not bother me because who cares what these people think! Making threats and carrying them out are two different things. There were death threats when my parents got married too. In the recent article by you on Love Jihad, you also stated Islam has become more unpopular today than it has ever been. Why do you feel so? Yes, Islam is unpopular today. The Middle East is on fire; there is war everywhere. There are a lot of extremist people from the Muslim community using Quran for their means and ends, thereby giving the entire religion a bad name. Islam is a religion of peace and submission but because of some people, it is perceived as a religion of violence. If you go up to an average American or British citizen and tell them you are a Muslim, they look at you suspiciously. It's not a good feeling. Have you ever faced a situation where you were looked at suspiciously because you are a Muslim? No. That's because I have a very secular vibe. People don’t associate me with any religion, and that's how I like it. The voice of moderate Islam needs to be modified and modernise, but does anyone understand the meaning of it? Does moderate Islam mean I can have a couple of pegs of whiskey? It might be wrong for a Muslim to drink but it's okay with me because I don’t think of myself as a Muslim. I think of myself as a human being. You said that Islam needs to modernise. How? People tried to modernise Judaism and many other religions, so why not Islam? People have died in the process. I guess you need someone like a Jesus Christ; a martyr who will be taken seriously. I guess someone will have to say that God has spoken to them and these rules no longer apply and it’s okay do certain things which were not allowed earlier. I am sure he will be killed because he'll say certain things against Islam. But later, his following will catch up as a religion called modernised Islam. But the Quran is said to be the word of God. How can you differentiate between what is modern and traditional? Exactly. You cannot challenge it. So someone will have to die before he is taken seriously. My point is that it’s not a great sign when a country reverts to Sharia law and it’s not a good sign for a country to be ruled by religion. Do I want to live under Sharia law? No. I wish there was one law for everyone in India. You are talking about a uniform civil code (one law for all Indians). Do you think it’s possible? People feel it’s not possible because it's idealistic and that the minorities will suffer. But I feel it is achievable. I don’t think it’s too much to ask for. If it is not possible, don’t expect everyone to think alike. We say we are one nation but there are different laws for different religions. But the law should be separate from religion. 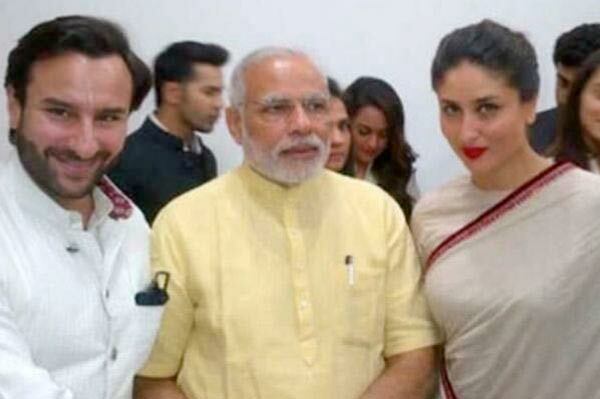 Kareena and you recently met Prime Minister Narendra Modi. How did that meeting go? I loved his gesture of coming down and meeting all of us personally. I have found him to say many things that I agree with, and a couple of things that I don't agree with. I appreciated his comments about giving credit to the previous government. He spoke about foreign investments and sanitation. He speaks with a lot of passion. He is the first person to make sense when he talks. He spoke positively about Pakistan, and that's never happened before. I think it's time we had a working man and someone who could deliver. (Interrupts) I never said he was glamorous. I think he is a paternal figure. Any civilised nation would go out and vote for a father figure. Out of all the guys contesting elections, he was like a father figure to me. Did you have any apprehensions about him before he became prime minister? Not realistically, but I discussed it with a lot of people. I heard many people comparing him to Hitler and I found that ridiculous. Do you think he is the right man to lead India? India thinks he is the right man and that is why he had a resounding victory. I hope and expect our country is guided to success. There was news recently that Kareena and you bought the first edition of Rudyard Kipling’s Jungle Book for your unborn child. Are you‘ll planning to start a family? Kareena said it was the first edition of Rudyard Kipling’s Jungle Book. I already owned the first edition but she bought me a nicer version of it. She also gave me a book on Milton’s poem and Spencer’s Fairy Queen. It was really sweet of her to gift me these books. She also bought me a book called Politically Correct Nursery Rhymes. Someone from the media thought we are having a baby and that’s why Kareena gifted me these books. But at the moment, we are not planning to start a family as we both are busy with work. I interviewed your father-in-law Randhir Kapoor recently and he said that Kareena does not want to have babies. (Thinks) He is her father so he knows best. (Laughs) No, not at the moment. (Thinks) I suppose people don’t need to get married if you don’t want kids. These things will happen at the right time. Did you appear for CAT 2014?